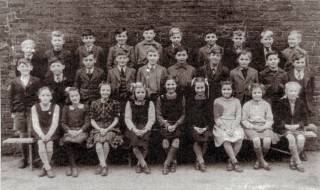 Bottesford School 1947. Which class was this? Back row, left. 2nd left, Herbert Plummer. Third left, correction, Mickey Damms. 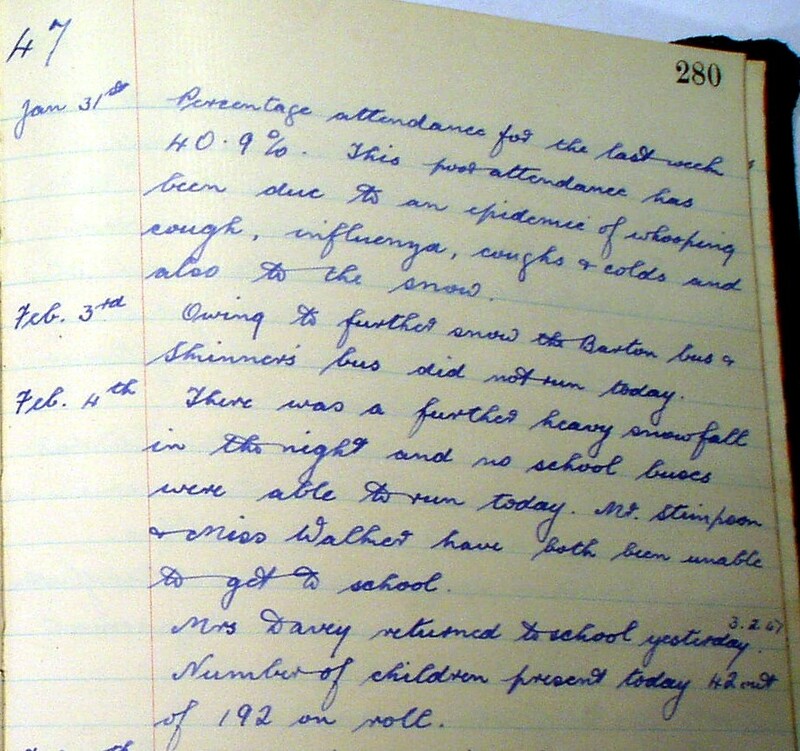 Bottesford Church of England School Log Book. We are grateful to Audrey Hamerton (nee Wright) of Wigston Magna who contacted Peter Topps with this picture of her class at Bottesford School in 1947.With help from her classmate, Jenny Norris, she has provided most of the names of the children in the picture. Can you identify any of the rest? 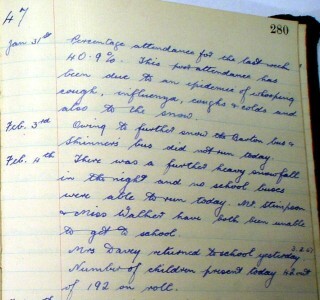 The problems continued throughout February and well into March, with pupils and staff unable to get to school. By April, things had improved. Electric light and heating were installed in the woodwork hut in Mr. Daybell’s field, where Mr. A. Parr started teaching. On July 3rd the school closed for a visit to the Royal Show at Lincoln. Yellow (Bottesford) House won the House Championship, there was swimming at the mill dam instead of P.T. and a cricket match against Grantham Central School. Who won? The log book doesn’t say. What can you remember about 1947? Let us know. 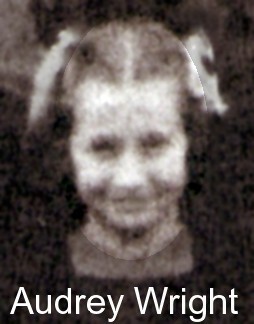 Thanks to Yolande Honey, who has sent us all but one of the missing names, which now appear below the pictures. Think it’s Barbara Fisher next to Jenny. Genty Page next to me? Then Pat Barnes. Cannot help with the boys. Good to hear from you, Mike. Thank you for the name. Yolande Honey has supplied the others, so we now have the full set.